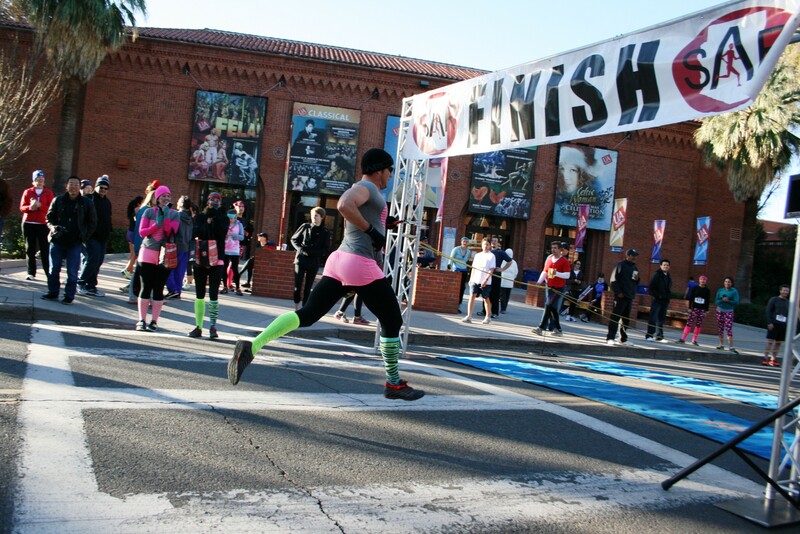 Get an early start on Valentine’s Day with this long-standing fun race staged at Old Main and the University of Arizona on the morning of Sunday, February 8, 2015 at Main Gate Square. 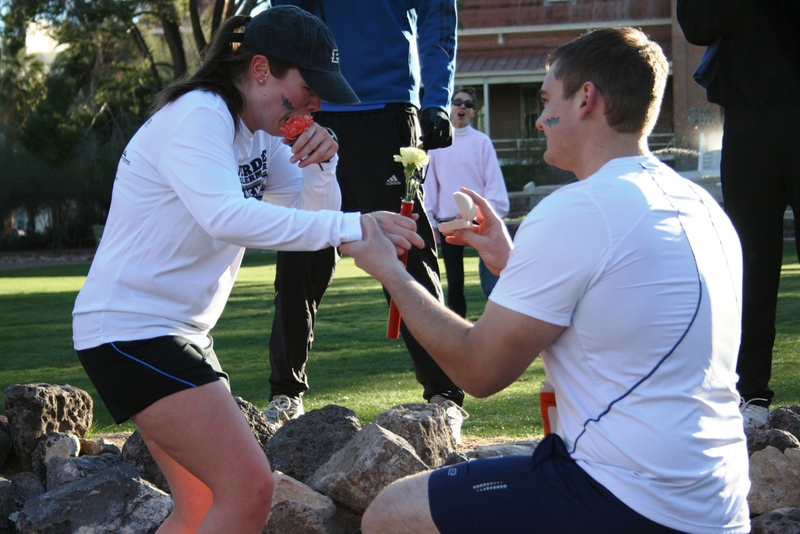 Choose between the 4 mile Couple’s Relay (Sweethearts, Just Friends or Parent-Child categories), the individual 4-mile race or the 2-mile fitness walk. Also look into the team challenge to win a keg! The race beneficiary this year will be Ben’s Bells Project. Registration and packet pick-up will be available race day from 7am-8am outside of Gentle Ben's Brewing with an 8:30am race start time. Then join for the awards party with mimosas (first one free for SAR members) on the Gentle Ben's Patio. New: Super soft triblend t-shirts are be available to order for an extra $8/shirt. Tshirts are not included in base registration price but will be available to purchase online at $8 each while supplies last. A small batch will also be available to purchase at packet pick up for $10 each. 4 mile couple’s relay: Two team members each run approximately 2 miles. Each team member will run up one set of football stadium ramps! See Couple’s categories below. 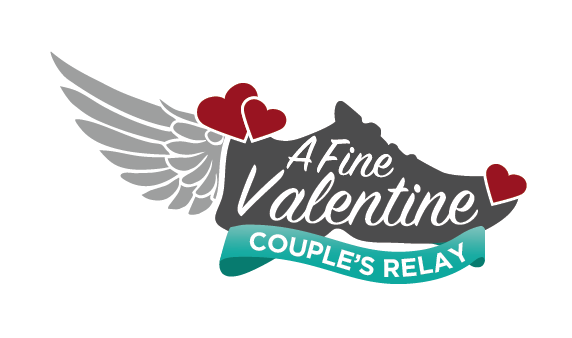 NOTE: you do not have to be a romantic couple to be in the couple’s relay. Just register in the “Just Friends” category if you and your teammate are strictly platonic! However, to receive any awards you do need to demonstrate some form of Public Display of Affection, otherwise known as PDA . . .
Special prizes for the best couple’s costume, so get creative! The best PDA will also earn an extra award! Group challenge: Win a Keg! Gather 4 to 7 relay teams and let us know what organization/group you are with when you register. The top 4 teams’ places in your group will be tallied. Low score wins! The grand prize for the team challenge will be a gift certificate for a keg from Barrio Brewing Co! (ALL group members must be over 21 to win this prize, sorry no exceptions). 4 mile (approximate) individual ramp run race: The individual race will be two loops, which means two sets of football stadium ramps! 2 mile non-competitive walk/jog: The 2 mile walk/jog is designed to promote daily exercise, so bring the whole family along! Strollers are welcome! Post-race festivities at Gentle Ben's Brewing : Awards, mimosas (first one free for SAR members), costume judging, Ben’s Bells booth and more! The course will be a 2 mile loop starting at Centennial Hall. It will take you along the UofA mall, past McKale Center, up & down a full set of football stadium ramps. After the big “hill” you’ll run below the stadium and take Cherry Ave back to the UofA mall. Then you’ll head towards Old Main & the exchange point where your lover (or friend) awaits to do the same route. 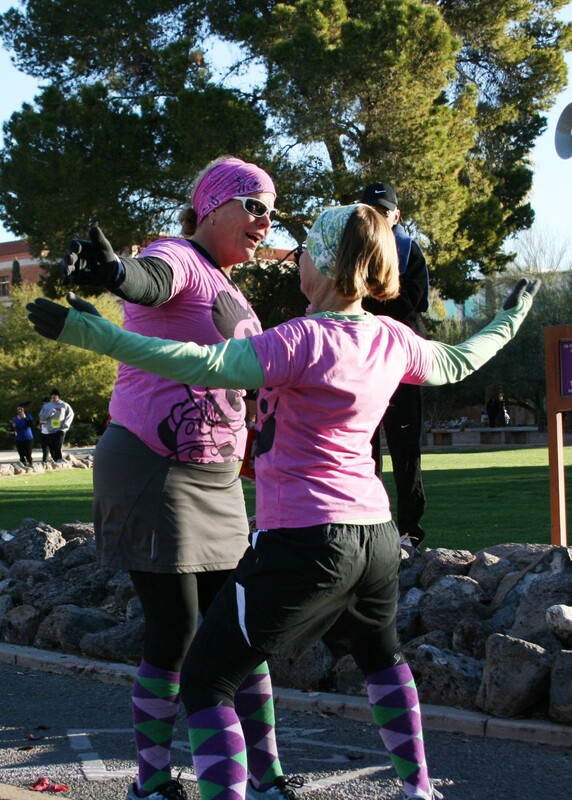 4-mile Indivudal races will do the loop twice & 2-mile walkers will do the loop once! Distances are not certified. Registration and packet pick-up will be available race day from 7am-8am, with an 8:30am race start time. Location: University Avenue, at the Main Gate at the University of Arizona outside of Gentle Ben's Brewing. Parking in nearby garages and on nearby streets.